Farm Girl Pink....: ~ International Harvesters - Not just tractors! Not going to lie. When I hear the name International Harvesters... I think of red tractors. I did grow up in Texas. And farming is a very ordinary thing here. Everyone has had a tractor of some type at home. If they had any type of acreage. If you didn't use it to plow with. You attached the mower blades and mowed the yard. Yet, International Harvesters also implies trucks too. 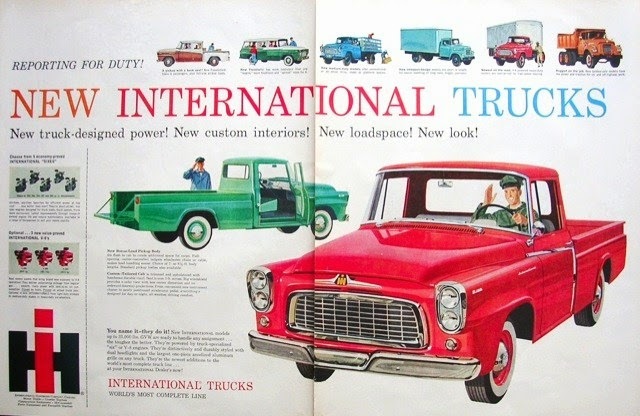 International Harvesters was a manufacturer over in Fort Worth, for many years. Matter of fact one of my great-uncle's retired from there. With them being in Fort Worth... that may have something to do with the many Scouts that survive around these parts. And all kinds of trucks. From the commercial box trucks to the pickups. 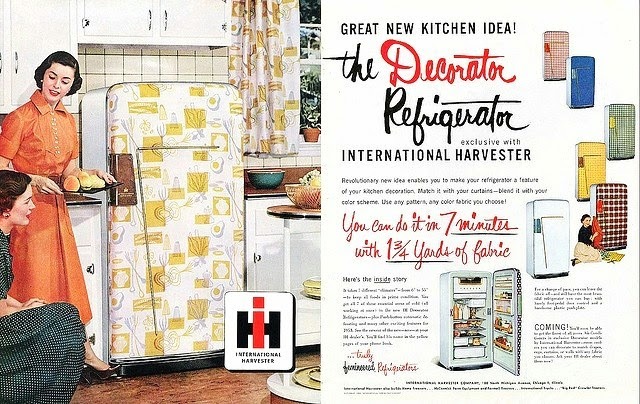 But I was not aware of the International Harvesters Decorator Refrigerators. And they are unique and fabulous! With less than 2 yards of fabric, you could slip cover your refrigerator! I think I am in love. 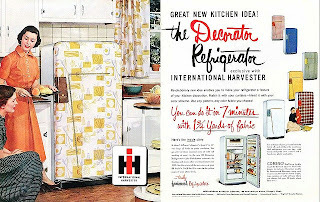 International Harvester’s Decorator refrigerator with changeable slipcover front. 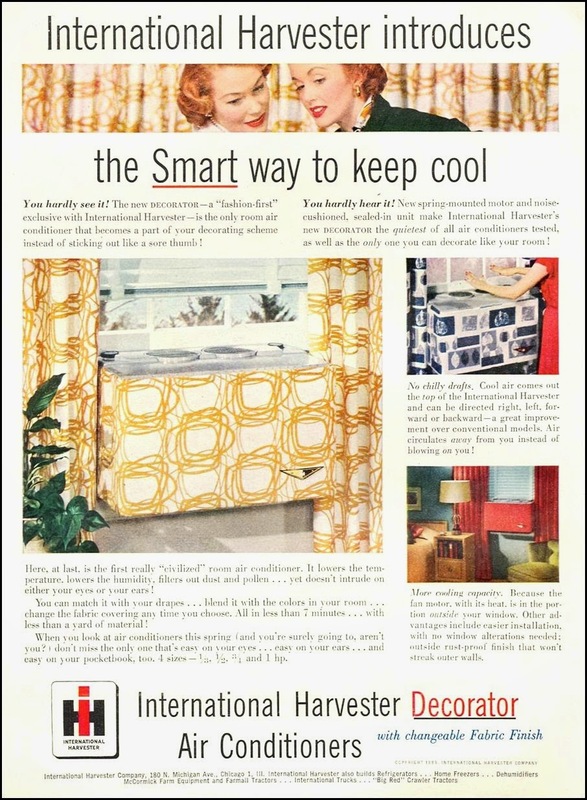 7 – climate cold, push button defrost. Sale $379.95 - No down payment. Only $19.00 a month. " Oh my goodness.... you could have custom slip covers made for it! How wonderful is that?!? I have harped endlessly about how I hate having only 3 option colors for new kitchen appliances. White, black and stainless steel. None of those choices remotely provokes me to buy a new refrigerator. 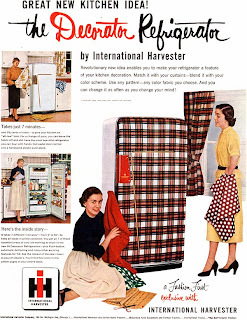 But there is more from International Harvesters for the home! 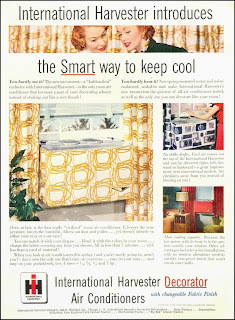 Not only could you slip cover your icebox.... you could also slip cover your window unit! How spectacular! This was a company courting their female buyers.
" The IH appliance division had originally been developed to manufacture commercial-grade items to farmers, most of whom had just received electricity by way of the many electrification projects in the U.S. before and after World War II. Among the offerings were milk coolers and walk-in freezers for produce and meat. Later on, IH courted the farmer's wife with kitchen refrigerators available in the latest designer styles. The IH spokeswoman for these products was Irma Harding, a factory trademark. 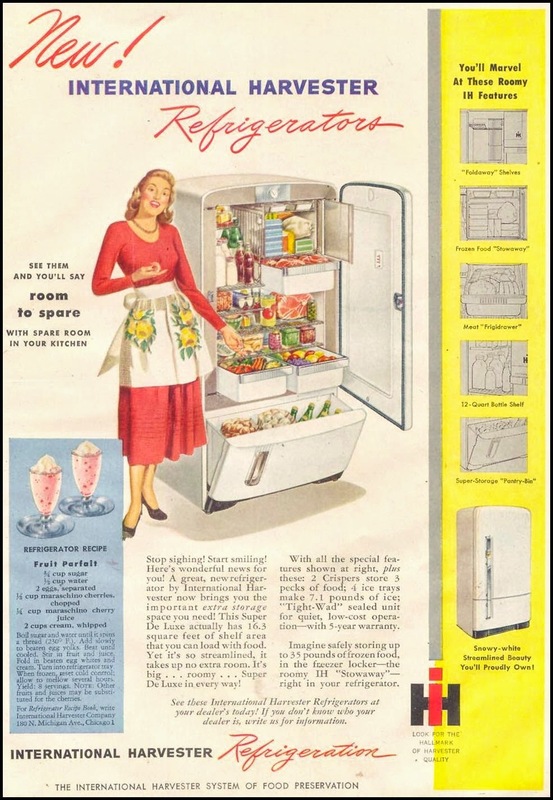 These products were introduced in 1947 and sold for less than 10 years. The refrigeration division was sold to Whirpool Corporation in 1955. 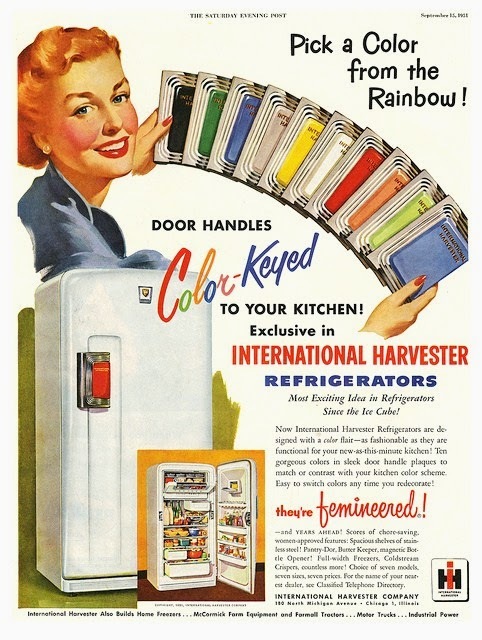 Since the time of production was short, IH appliances are rare today..."
So if slip covering your refrigerator is not your thing... you could pick out the new sassy color handle! Or just pick out a nice white refrigerator, with the new shelving units and drop down freezer bottom. For better use of the space inside it! 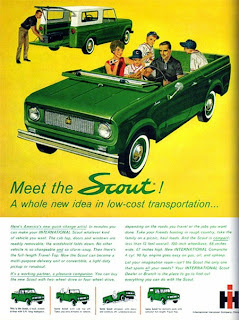 I have seen those ads in my old magazines and was surprised the first time I saw one. I don't think I would care to have cloth over the front of my fridge. I would have to take it off to wash quite a bit. I can see why that didn't take off. But I am with you about color. I hate stainless steel or black. But them I hate to see brown, gold or avocado try to come back. I have my grandpa's 1947 Farmall red tractor in my front yard. We live on 2 acres so it's the perfect lawn decoration. People stop all the time to take photos! What has my interest peaked... how did one get that slip cover to stay taunt over the refrigerator door. And was a special quality of fabric used. One that could be wiped down. Like the stuff they used for picnic table cloths then.